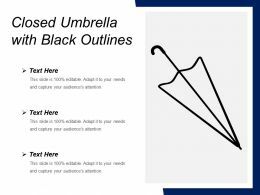 We are proud to present our five staged umbrella chart powerpoint template. 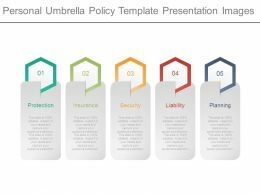 Five staged umbrella chart has been used to design this power point template. This PPT diagram contains the concept of safety and protection. 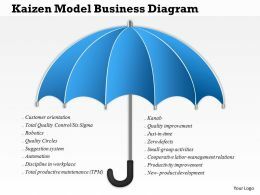 Use this PPT diagram for business and finance related presentations. 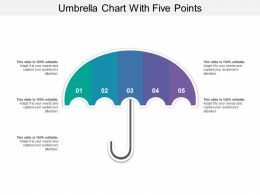 Presenting this set of slides with name - Umbrella Chart With Five Points. This is a five stage process. The stages in this process are Umbrella Chart, Umbrella Graph, Umbrella Statistics. 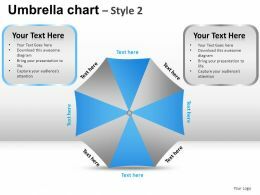 Presenting this set of slides with name - Five Steps Umbrella Chart With Icons. This is a five stage process. The stages in this process are Umbrella Chart, Umbrella Graph, Umbrella Statistics. Presenting cocktail drink with straw and umbrella. 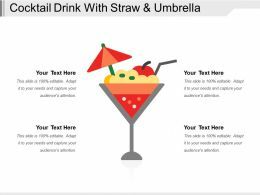 This is a cocktail drink with straw and umbrella. This is a one stage process. The stages in this process are cocktail, mixed drink, alcohol. 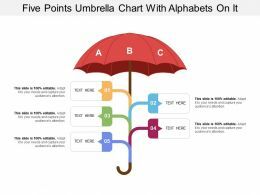 Presenting this set of slides with name - Five Points Umbrella Chart With Alphabets On It. This is a five stage process. The stages in this process are Umbrella Chart, Umbrella Graph, Umbrella Statistics. 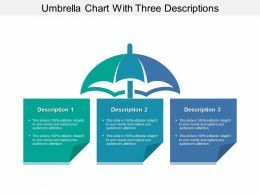 Presenting this set of slides with name - Three Steps Umbrella Chart With Icons. This is a three stage process. The stages in this process are Umbrella Chart, Umbrella Graph, Umbrella Statistics. 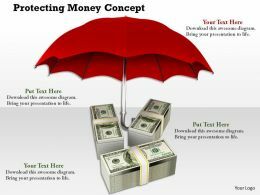 Presenting this set of slides with name - Financial Security Icon Showing Dollar With Umbrella. This is a two stage process. The stages in this process are Financial Security, Economic Security, Fund Security. 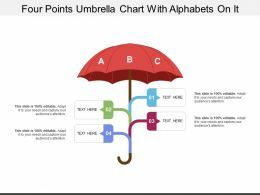 Presenting this set of slides with name - Umbrella Chart With Four Points. This is a four stage process. The stages in this process are Umbrella Chart, Umbrella Graph, Umbrella Statistics. 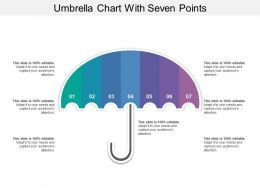 Presenting this set of slides with name - Umbrella Chart With Seven Points. This is a seven stage process. The stages in this process are Umbrella Chart, Umbrella Graph, Umbrella Statistics. 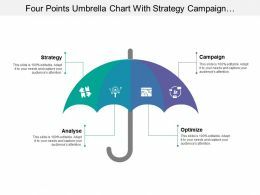 Presenting this set of slides with name - Four Points Umbrella Chart With Strategy Campaign Analyse And Optimize. This is a four stage process. The stages in this process are Umbrella Chart, Umbrella Graph, Umbrella Statistics. 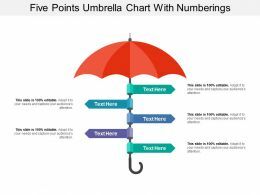 Presenting this set of slides with name - Five Points Umbrella Chart With Numberings. This is a five stage process. The stages in this process are Umbrella Chart, Umbrella Graph, Umbrella Statistics. 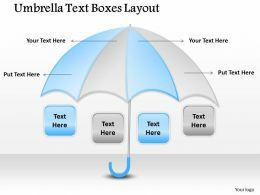 Presenting umbrella covering four points icons and text boxes. 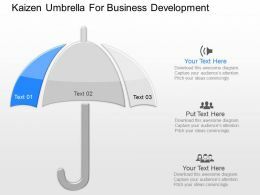 This is a umbrella covering four points icons and text boxes. This is a four stage process. The stages in this process are stakeholder management, project delivery, corporate communication. 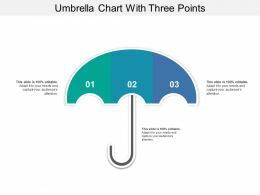 Presenting this set of slides with name - Umbrella Chart With Three Points. This is a three stage process. 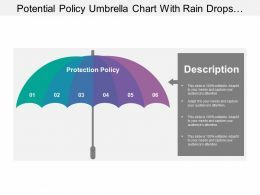 The stages in this process are Umbrella Chart, Umbrella Graph, Umbrella Statistics. 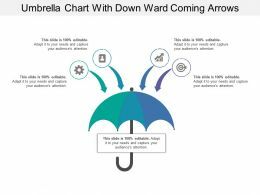 Presenting this set of slides with name - Umbrella Chart With Down Ward Coming Arrows. This is a five stage process. The stages in this process are Umbrella Chart, Umbrella Graph, Umbrella Statistics. 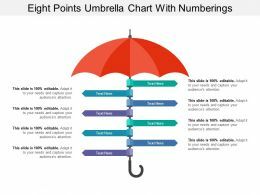 Presenting this set of slides with name - Eight Points Umbrella Chart With Numberings. This is a eight stage process. The stages in this process are Umbrella Chart, Umbrella Graph, Umbrella Statistics. Presenting this set of slides with name - Umbrella Chart With Three Descriptions. This is a three stage process. The stages in this process are Umbrella Chart, Umbrella Graph, Umbrella Statistics. "Microsoft PowerPoint Template and Background with 3d illustration flying umbrellas over storming sky background"
Presenting this set of slides with name - Seven Points Umbrella Chart With Numberings. This is a seven stage process. 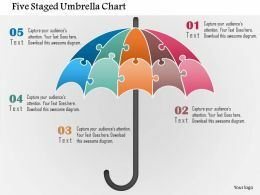 The stages in this process are Umbrella Chart, Umbrella Graph, Umbrella Statistics. 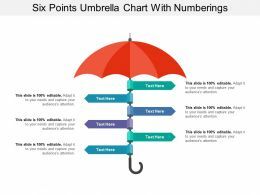 Presenting this set of slides with name - Six Steps Umbrella Chart With Icons. This is a six stage process. 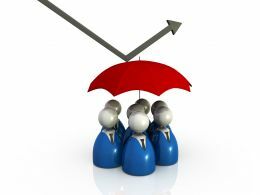 The stages in this process are Umbrella Chart, Umbrella Graph, Umbrella Statistics. …our safety apps for communication flat powerpoint design. Concept of safety apps for communication has been displayed in this power point template diagram. 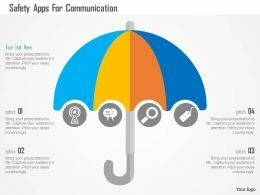 This PPT diagram contains the graphic of umbrella with safety apps symbols. 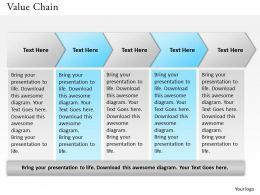 Use this PPT diagram for communication related presentations. Presenting this set of slides with name - Financial Security Icon Showing Coin Under Umbrella. This is a one stage process. The stages in this process are Financial Security, Economic Security, Fund Security. Presenting health safety environment showing umbrella and leaf in hand symbol. 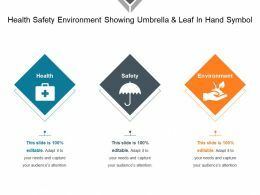 This is a health safety environment showing umbrella and leaf in hand symbol. This is a three stage process. The stages in this process are health safety environment, ehs, environmental protection. Presenting umbrella fallen on ground. This is a umbrella fallen on ground. This is a four stage process. The stages in this process are umbrella icon, parasol icon, sunshade icon. 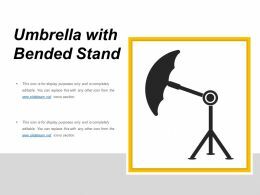 Presenting umbrella with bended stand. This is a umbrella with bended stand. This is a two stage process. The stages in this process are umbrella icon, parasol icon, sunshade icon. Presenting this set of slides with name - Table Chair Umbrella Icon. This is a four stage process. The stages in this process are Chair Icon, Seat Icon, Furniture Icon. 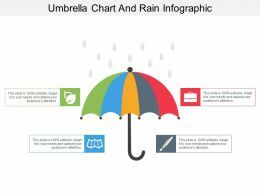 Presenting this set of slides with name - Umbrella Chart And Rain Infographic. This is a five stage process. The stages in this process are Umbrella Chart, Umbrella Graph, Umbrella Statistics. 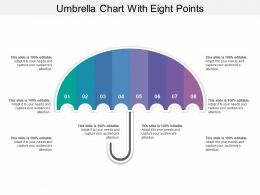 Presenting this set of slides with name - Umbrella Chart With Eight Points. This is a eight stage process. The stages in this process are Umbrella Chart, Umbrella Graph, Umbrella Statistics. 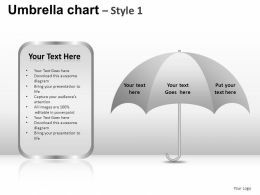 Presenting this set of slides with name - Umbrella Chart With Six Points. This is a six stage process. The stages in this process are Umbrella Chart, Umbrella Graph, Umbrella Statistics. Presenting closed umbrella with black outlines. This is a closed umbrella with black outlines. This is a three stage process. The stages in this process are umbrella icon, parasol icon, sunshade icon. 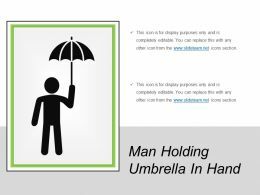 Presenting man holding umbrella in hand. This is a man holding umbrella in hand. This is a two stage process. 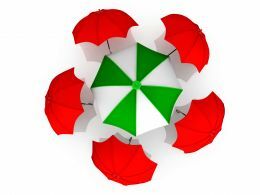 The stages in this process are umbrella icon, parasol icon, sunshade icon. 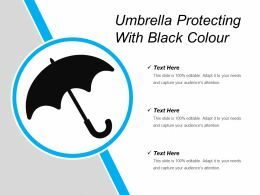 Presenting umbrella protecting with black colour. This is a umbrella protecting with black colour. This is a three stage process. The stages in this process are umbrella icon, parasol icon, sunshade icon. Presenting umbrella with protection from sun. 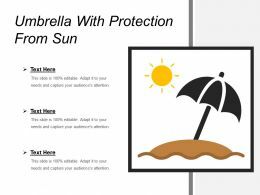 This is a umbrella with protection from sun. This is a three stage process. The stages in this process are umbrella icon, parasol icon, sunshade icon. 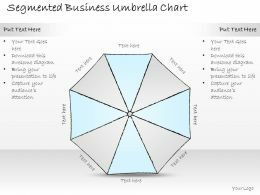 Presenting this set of slides with name - Eight Steps Umbrella Chart With Icons. This is a eight stage process. The stages in this process are Umbrella Chart, Umbrella Graph, Umbrella Statistics. 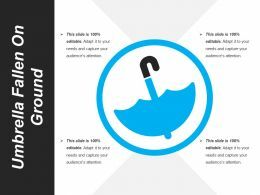 Presenting this set of slides with name - Five Step Umbrella Chart With Icons. This is a five stage process. The stages in this process are Umbrella Chart, Umbrella Graph, Umbrella Statistics. 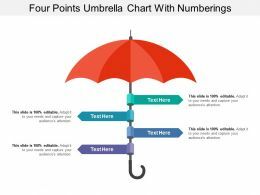 Presenting this set of slides with name - Four Points Umbrella Chart With Numberings. This is a four stage process. The stages in this process are Umbrella Chart, Umbrella Graph, Umbrella Statistics. 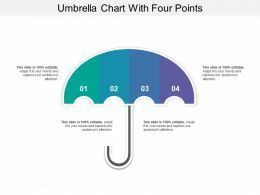 Presenting this set of slides with name - Four Steps Umbrella Chart With Icons. This is a four stage process. The stages in this process are Umbrella Chart, Umbrella Graph, Umbrella Statistics. 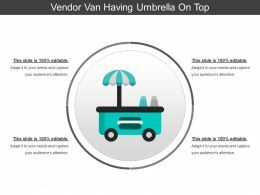 Presenting this set of slides with name - Seven Steps Umbrella Chart With Icons. This is a seven stage process. 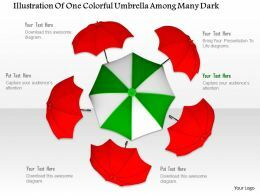 The stages in this process are Umbrella Chart, Umbrella Graph, Umbrella Statistics. 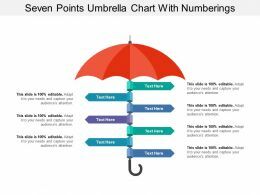 Presenting this set of slides with name - Six Points Umbrella Chart With Numberings. This is a six stage process. The stages in this process are Umbrella Chart, Umbrella Graph, Umbrella Statistics. 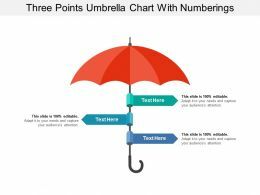 Presenting this set of slides with name - Three Points Umbrella Chart With Numberings. This is a three stage process. The stages in this process are Umbrella Chart, Umbrella Graph, Umbrella Statistics. Presenting person sitting on beach with umbrella. 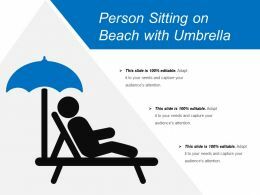 This is a person sitting on beach with umbrella. This is a three stage process. The stages in this process are umbrella icon, parasol icon, sunshade icon. 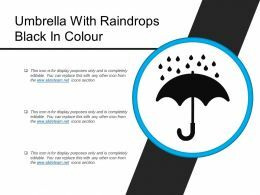 Presenting umbrella with raindrops black in colour. This is a umbrella with raindrops black in colour. This is a three stage process. The stages in this process are umbrella icon, parasol icon, sunshade icon. 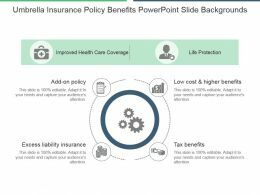 Presenting personal umbrella policy template presentation images. 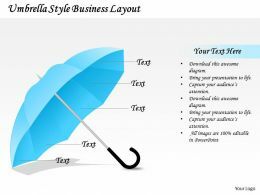 This is a personal umbrella policy template presentation images. This is five stage process. The stages in this process are protection, insurance, security, liability, planning. 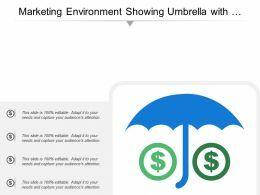 Presenting this set of slides with name - Marketing Environment Showing Umbrella With Dollar Signs. This is a three stage process. The stages in this process are Micro Environment Macro Environment. Presenting this set of slides with name - Risk Management Person With Umbrella Icon. This is a one stage process. The stages in this process are Governance Icon, Risk Management Icon, Compliance Icon. 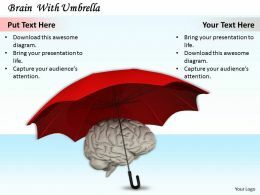 Presenting this set of slides with name - Icon Of Red Umbrella At Beach Powerpoint. This is a five stage process. The stages in this process are Beach Template, Oceanic Landforms, Coastal Landforms. 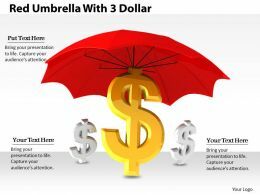 Presenting money risk icon with dollar and umbrella. 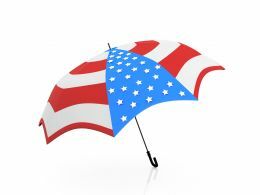 This is a money risk icon with dollar and umbrella. This is a one stage process. The stages in this process are money risk, investment risk, finance risk. 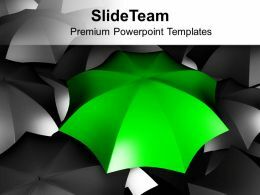 "Microsoft PowerPoint Template and Background with an umbrella which is not similar to other umbrellas"
Presenting this set of slides with name - Eight Points Umbrella Chart With Alphabets On It. This is a eight stage process. The stages in this process are Umbrella Chart, Umbrella Graph, Umbrella Statistics. 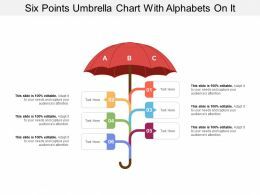 Presenting this set of slides with name - Four Points Umbrella Chart With Alphabets On It. This is a four stage process. The stages in this process are Umbrella Chart, Umbrella Graph, Umbrella Statistics. 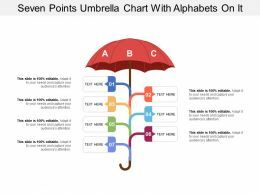 Presenting this set of slides with name - Seven Points Umbrella Chart With Alphabets On It. This is a seven stage process. The stages in this process are Umbrella Chart, Umbrella Graph, Umbrella Statistics. 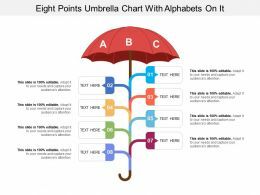 Presenting this set of slides with name - Six Points Umbrella Chart With Alphabets On It. This is a six stage process. The stages in this process are Umbrella Chart, Umbrella Graph, Umbrella Statistics. Presenting this set of slides with name - Three Points Umbrella Chart With Alphabets On It. This is a three stage process. The stages in this process are Umbrella Chart, Umbrella Graph, Umbrella Statistics. 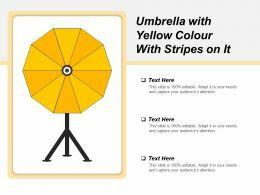 Presenting umbrella with yellow colour with stripes on it. This is a umbrella with yellow colour with stripes on it. This is a three stage process. The stages in this process are umbrella icon, parasol icon, sunshade icon. 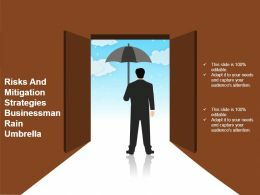 Presenting risks and mitigation strategies businessman rain umbrella powerpoint layout. 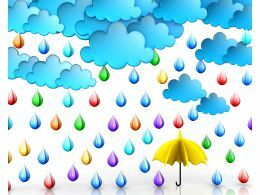 This is a risks and mitigation strategies businessman rain umbrella powerpoint layout. This is a one stage process. 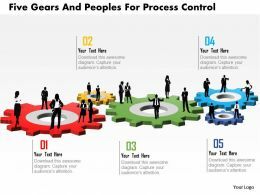 The stages in this process are risk management, risk mitigation, risk planning. 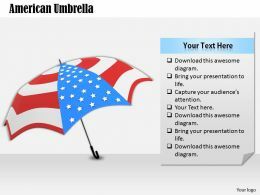 We are proud to present our 1014 american flag print umbrella image graphics for powerpoint. 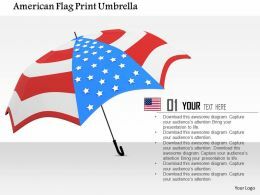 This Power Point template has been designed with graphic of American flag print umbrella. This PPT contains the concept of safety for US peoples. Use this PPT for your national security related topics. 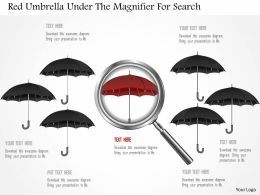 We are proud to present our 0115 red umbrella under the magnifier for search powerpoint template. Graphic of red umbrella and magnifier has been used to craft this PPT diagram. This PPT contains the concept of search. 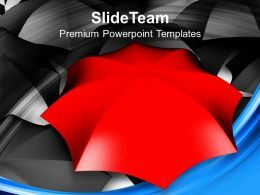 Use this PPT for data and business related presentations.